Lobster-shaped tin filled with sugar-free peppermints. Smiling lobster has two blue strong rubber bands to keep the �claws� in check. 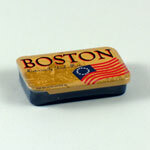 One of the rubber bands reads �Boston�. Tin is approximately 3 �" long x 3" wide x �" deep. Net weight approximately 0.44 ounces. Product made in USA, tin made in China.